Edgar waited under the big "Pier 80" sign for Travis. Travis swung his silver SUV close to the Food Runners truck, beckoning Edgar to follow him. Edgar followed Travis through the gate which Travis unlocked and out onto the pier. The hull of the ship soared upward taking an enormous gunmetal bite out the clear blue sky. The Food Runners truck looked like a Matchbox toy next to the giant freighter. Travis led Edgar up the ridged gangplank, through the city-block wide door and into the cavernous hull. A small crew of brawny, seafarers waited by two refrigerators the size of storage units. "In here we have the more perishable food," said Dean indicating the fridge on the right. "And in here we have all the frozen items. We have a lot of ice cream. Do you need coolers to transport it?" "No," Edgar replied. "The Food Runners truck has refrigeration and, anyway, the food goes directly to the shelters. It won't be on board very long." "Ok, gents," Dean signaled to his crew. "Let's load it up." With that, the men piled box after box onto a pallet. A pallet lifter standing at the ready transported the food to the ship's entrance. From there, the fellas hand carried the boxes down the ramp and helped Edgar load up the truck. There were melons. The were oranges. There was orange juice by the gallon; cases and cases of milk in individual cartons. 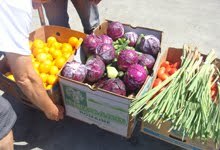 Cases of butter, grapes, fresh green peppers, yellow peppers, celery, bags of onions and so much more. And that was just the first fridge! Dean explained that the ship carried a crew of 60 and had come to port a day earlier than expected. The contents of fridge number one filled the Food Runners truck to capacity. Edgar peeked into fridge number two. The freezer load was twice as big. "The truck has to be ready for the Farmer's Market by 12:30 on Saturdays," Edgar told Travis. "Can I come back for the frozen food tomorrow?" he asked. "Sure," Travis said. "Tomorrow will be no problem. Same time?" "Sounds good," Edgar replied. Edgar closed the back of the truck and set out to make his deliveries. "Food Runners! The answer to tomorrow's brunch," remarked the chef on duty at Martin DePorres. "It's my lucky day!" exclaimed the chef at the Lucille Withe Center when Edgar rolled up the truck door. "Wow. We really need this," the chef at Hamilton Family Center sighed in relief. The food from the ship filled the Food Runners truck to bursting a total of three times. The freezer food included top of the line steaks, shrimp, case after case of Haagen Daz ice cream bars (the good ones with the yummy crunchies in the chocolate coating) and more. "We come into San Francisco 3-4 times a year, " Dean stated. "I'm so glad I found Food Runners. Now we never have to toss good food away again. We'll call you whenever we're in port." Food Runners can't wait. The ship really came in! Besides the big ship, please welcome new Food Runners donors, St. Finn Barr Catholic School, and Parkside Lending. Fall convention and gala season is here making for Food Runners busiest months of the year. To say nothing of end of summer harvest which yields the largest donations of the year from the 13 farmers markets that Food Runners picks up from. ted in the heart of the Mission District. Chef Jason Fox and team craft inventive tasting menus from which a portion goes to local charities. For two weeks in September, $10 from each tasting menu went to Food Runners. Thank you, Commonwealth! What kind of parties will you be attending this fall? Be sure to let the hosts know about Food Runners. Party leftovers need never be thrown away. Food Runners will happily pick them up and deliver them to San Franciscans in need. A quick call to 415-929-1866 is all it takes.